Ever wish you could combine better-than-barefoot technology with the comfort of a Klog? Now you can, with “WOW” Komfort© from KLOGS®-USA. KLOGS are made from our secret, super-strong polyurethane formula, a material that’s durable yet soft, easily washable, and provides both slip and oil resistance. 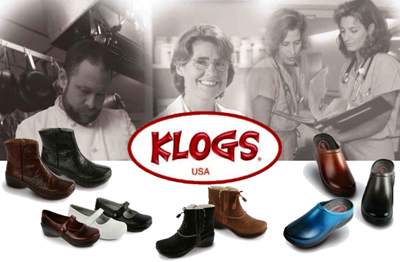 Our Klogs’ footbed and outsole are crafted to provide outstanding shock absorption. As a result, we’re confident you’ll agree that wearing a Klog gives you the comfort of wearing nothing at all on your feet. KLOGS are available in a variety of colors, and our white KLOGS feature Perma-White technology that keeps them staying bright ten times longer than our competitors’ white shoes. KLOGS is proud to say that all of our molded polyurethane KLOGS are MADE IN THE USA.